I tried to buy lunch today. I got this brainy idea yesterday – I’d visit the newly-opened restaurant on the corner, visit our famous museum, visit our famous art gallery, and enjoy ice cream for supper sometime around 7:30 this evening. President’s Choice Vanilla mixed with Breyer’s Dark Chocolate Truffle. I have enough left of each for one big bowl of it. I have saved it as a kind of a reward. For enduring a “webinar” I should listen to for professional purposes. That I’d rather not. I live in a small town. People correct me, correctly, to advise that it is, in fact, a small City, Capital “C” – but it is really a town. And I – along with a large portion of the downtown populace – have been watching the dismantling of a failed culinary adventure for some months now, hoping, eagerly, for a different eatery to plunk down, prosper, and stay. Downtown took terrible hits years ago, I am told, losing commerce and all to the outskirts mall. Slowly, it’s been coming back. Each piece of the core propping up and encouraging the others. Two days ago, through the new, massive dark windows of this renovation venture, we could see booths and mops. Yesterday the signs were up, lights lit, the windows were rolled open and the happy hubbub of satisfied diners emanated out to those of us walking dogs and the like. I googled the menu. I counted the cash. I walked over. I rejoiced in the closed windows – hey, it’s over thirty degrees Celsius with the humidity today – and then I went in. My rule is: five minutes or being ignored by six separate staff, and I’m outta there. This lovely space, which shall remain nameless, was full. Unfortunately, it has been designed with a large number of extraordinarily comfortable looking six-person curved booths, many four-person booths along the long window wall, and a large, disheartening collection of tippy-toppy high tables for four, with matching tippy-toppy bar stools. And that’s it. So parties of two monopolize more room than is otherwise necessary. And parties of one do not belong. Also, as I stood there, I decided that no matter what happened, the high chairs were not a prudent perch. I am tall enough to hop up. Visions of my rump accelerating all the way down to the floor under a broken stool preoccupied me for a while, though. I did have some time to think about safety, and spectacle, and the social aspects and psychology of seating and comfort. As well as the optics of being elevated among this crowd to eat a burger. In a city, people eating lunch do not gawk at whomever comes in, and then they do not gawk again when that person waits for a table. As I took inventory of seating design, I made slightly too long, disconcerting (for me) eye contact with probably ten customers, at whom I smiled, because this is a small town, but not one of the five individual wait staff walking right past me standing there would look me in the eye. You know that swervy motion people make with their whole head when a big bee flies by their nose? That’s what I got. Five times. The owners have another version of this place in a town close by that is spoken of highly. Ostensibly, they’ve done this “service” routine before. They may have, in fact, encountered a lone person waiting for a table in a full place before. I can’t tell you anything about it or what might have happened, though, because in a city, a staff member would say, “Hi! We’re so busy today! We’ll have a table in about twenty minutes. Is that okay?” In a town, this big woman is, to those from whom I would’ve ordered a big meal and a pint, and tipped well, absolutely invisible. It’s Las Vegas, pay-per-view magical. Except to ten customers. Who’d probably would’ve watched me eat. And drink. And break a chair. So they may prosper, but they’ll do it without me. 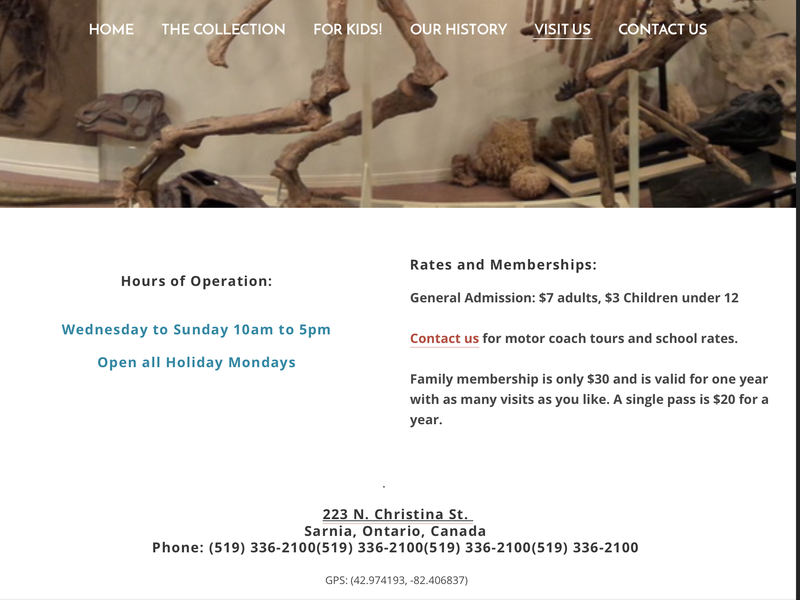 Off I went to the famous, privately owned Stones & Bones Museum. Entrance fee: $7 even. Stuffed with an alarming large and varied menagerie of taxidermy, fantastic fossils, information posters, preserved specimens of this, that, and the other, and possessed of an excellent gift shop. The best thing about the Stones & Bones, though, amid the walls of beetles and butterflies and shark jaws and gems and dinosaur pieces and hunks of copper and snake skins and bird-killing spiders and EVERYTHING is the ebullient banter of amazed, chattering, joyful kids. One of whom, unprompted, pointed out to me in particular more details about a specific iridescent butterfly than I was quite prepared to enjoy. But still. There’s something wrong with you if you forget how that was – to see something so wondrous for the first time, and to tell somebody about it. It’s a great place. 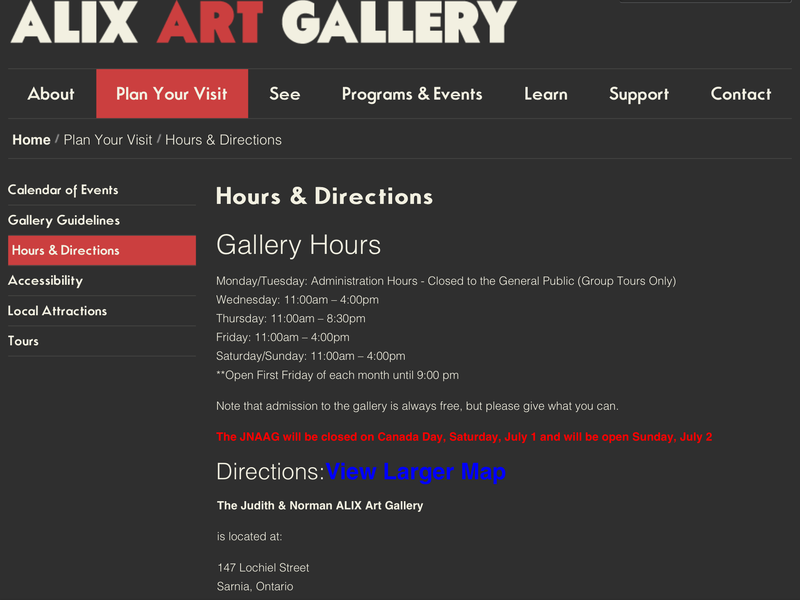 So off to the Judith & Norman Alix Art Gallery. All contents actually owned by this sliver of a gem. As you will be told three times – all contents owned, I mean – and will thus, in all likelihood, remember. Admission free, donations gladly accepted. Two Emily Carr works beautifully displayed, with illustrations of how one, in particular, was restored to its bright self. Respectable Group of Seven in small number. Modern stuff upstairs. Pleasant and knowledgeable reception, and two interestingly informative volunteers. Thank you. I’ll be back in a year. And then I walked my heat-heavy ankles over to a pub that had its doors all open. In this heat! So I came home. Supper will be cremini mushrooms in olive oil and butter, with garlic and spinach, on spaghettini. And a beer. I doubt very much that there is a webinar in my near future. There will be ice cream. My ankles have returned to happiness. A good day, even without lunch.